I Feel Bad Review - Demographic Strain Hampers NBC Comedy - Are You Screening? I Feel Bad follows in the footsteps of the half-dozen or so efforts that hit every year that are tweaked and molded to aim at a very specific demographic. Fewer and fewer of these shows last a full season, and in this case, it’s a real shame. The particular sub-genre/niche in question is the family sit-com that revolves around the difficulties of adulthood, in one sense or another. Key to the brand of series here is that it doesn’t really have any teeth, and kicks off with a gimmick that it’s likely to abandon after a few episodes. I Feel Bad doesn’t feel like it started out hoping to corner the available market for bland, safe comedy, mostly because quite a bit of its humor opens the door to territory the show never actually approaches. Worst of all, it’s actually funny at times and has a cast that is worthy of delivering more. 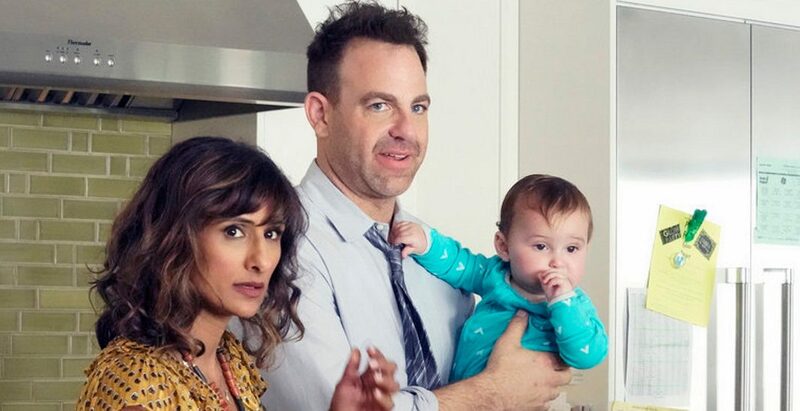 Sarayu Blue plays Emet, a wife and mother whose connection, apparently, to the collective consciousness of those the show hopes to attract, is that she always feels bad about something. If she isn’t spending enough time with her kids, or isn’t supporting their hopes and dreams enough, then she’s having fantasy dreams about other men. It’s impossible to list the myriad ways she imagines she is failing her family and/or life, because there’s always something new. The name of the game is the internal struggle inherent in everything that happens to her, which means she builds in the ability to feel guilty about every decision she makes. Her daughter is suddenly involved in an excessively suggestive dance class, which means she has to nip things in the bud, but wants to support what her daughter wants to do… unlike her own mother, who threw a lot of shoes. As if her throttling guilt isn’t enough on its own, she doesn’t have time enough in the day to do everything for everyone, which is what she obviously should do, and keeps adding more to her calendar. Adding yet more to her effort, she’s in charge of the art department at a video game company, which means she oversees a crew of self-described nerds, and her half-mother half-boss position comes with more work tha it should. As the series kicks off, we see that having a sounding board at work that is not exactly made of your peers is a double-edged sword. When it comes to difficulties with her children, she has a younger perspective to tap into, but she also works with… well, more or less children. The show has a lot of elements working in its favor, including a cast that should be able to make a sit-com work on charisma alone. Paul Adelstein (Girlfriend’s Guide to Divorce) plays Emet’s husband, David, and he can focus a scene’s energy when given half a chance, but thus far he’s given little to do. Johnny Pemberton is the head nerd of the work crew, and may well become one of the comic geniuses of the next decade. He’s responsible for the show’s best moments, due in equal measure to the fact that he has great timing and nerds are allowed to be a bit more odd. The problem is that it also has a lot of elements working against it, and doesn’t seem to know what to do with what it has. It’s also a curious sort of stagy through the first few episodes, which hampers a lot of the comedic potential. I Feel Bad‘s best shot is to forget that it feels bad as quickly as possible, and stop suffering from its useless shtick’s own problems. It wants to be for everyone, which means that it isn’t doing anything particularly well, and while it sets up a dozen different avenues to draw from (Emet’s children, parents, work, husband, etc. ), it would be far better off aiming mostly at one of them. The show has some laughs, and there’s definite potential, but it has to pick a gear before anyone is going to care.